Every year, the Social Security Trustees are required by law to project the program’s finances 75 years into the future. 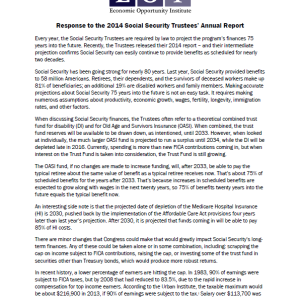 Recently, the Trustees released their 2014 report – and their intermediate projection confirms Social Security can easily continue to provide benefits as scheduled for nearly two decades. Social Security has been going strong for nearly 80 years. Last year, Social Security provided benefits to 58 million Americans. Retirees, their dependents, and the survivors of deceased workers make up 81% of beneficiaries; an additional 19% are disabled workers and family members. Making accurate projections about Social Security 75 years into the future is not an easy task. It requires making numerous assumptions about productivity, economic growth, wages, fertility, longevity, immigration rates, and other factors. When discussing Social Security finances, the Trustees often refer to a theoretical combined trust fund for disability (DI) and for Old Age and Survivors Insurance (OASI). When combined, the trust fund reserves will be available to be drawn down, as intentioned, until 2033. However, when looked at individually, the much larger OASI fund is projected to run a surplus until 2034, while the DI will be depleted late in 2016. Currently, spending is more than new FICA contributions coming in, but when interest on the Trust Fund is taken into consideration, the Trust Fund is still growing. The OASI fund, if no changes are made to increase funding, will, after 2033, be able to pay the typical retiree about the same value of benefit as a typical retiree receives now. That’s about 75% of scheduled benefits for the years after 2033. That’s because increases in scheduled benefits are expected to grow along with wages in the next twenty years, so 75% of benefits twenty years into the future equals the typical benefit now. An interesting side note is that the projected date of depletion of the Medicare Hospital Insurance (HI) is 2030, pushed back by the implementation of the Affordable Care Act provisions four years later than last year’s projection. After 2030, it is projected that funds coming in will be able to pay 85% of HI costs. There are minor changes that Congress could make that would greatly impact Social Security’s long-term finances. Any of these could be taken alone or in some combination, including: scrapping the cap on income subject to FICA contributions, raising the cap, or investing some of the trust fund in securities other than Treasury bonds, which would produce more robust returns. In recent history, a lower percentage of earners are hitting the cap. In 1983, 90% of earnings were subject to FICA taxes, but by 2008 that had reduced to 83.5%, due to the rapid increase in compensation for top income earners. According to the Urban Institute, the taxable maximum would be about $216,900 in 2013, if 90% of earnings were subject to the tax. [i] Salary over $113,700 was not taxed in 2013. The cap on earning could also be scrapped entirely or greater levels of earnings could be taxed at decreasing percentages. Another option is to invest some of the trust funds in other types of investments. Private pension funds and state-run public sector retirement systems all invest in a broad range of securities. Well-run public retirement systems like those in California and our state of Washington have average returns well above US Treasury Bonds. For example, California had returns that averaged 7.1% per year for the ten year period that ended June 30, 2013. [ii] This period included the market crash where calendar year 2008 returns were -27.8%. The volatility of the market, including the occasional crash, is smoothed out over the long term in very large pension funds. It’s critical to understand that the idea of investing some Social Security Trust Funds in private securities is very different from “privatizing” Social Security, which would involve forcing workers to manage their own individual accounts. Individual workers managing their own accounts would be a disaster. The value of systems like those in Washington state and California includes the professional investment managers, the combined pool of funds from many thousands of workers, and not having to manage assets to meet the yearly income stream of one individual retiree. One final way to improve the assets in the Trust Fund doesn’t require government action at all. It’s a private sector solution. Corporations and businesses could simply pay workers more. Up until the past several decades gains in productivity, which results in more profit for business, were shared by companies and workers. Workers’ pay increased as productivity increased. If corporations shared their profits more equitably and proportionately with workers, the increased wages and salaries and the associated FICA taxes paid on that compensation would fund the Trust Fund shortfall.